The Berbers are a non-Arab ethnic group that can be found largely in present day Algeria, Morocco, Libya, and Tunisia. A fraction of them can also be identified in Egypt, Niger, Mauritania, Mali and Burkina Faso. Some Berbers have over the years migrated to some European countries including France, Spain and Belgium. According to Hsain llahiane, in his work Historical Dictionary of the Berbers (Imazighen) (2006), the habitation of North Africa by the Berbers dates back to 10,000 B.C. In the past, many Berber Kingdoms emerged though no king had been able to unite the kingdoms into an empire. Notable among these kingdoms were the Mauri, Masaesyli and the Massyli kingdoms. At a point, the Massyli kingdom and the eastern parts of the Masaesyli kingdoms were joined to form the Numidia kingdom. This was after 220 B.C. One of the factors that accounted for the rise of Berber kingdoms was the introduction of camel to the area. Academia is not too certain about who or when camel was introduced to North Africa but it has generally been attributed to the Romans because it was during their time in North Africa that the use of camel spread. 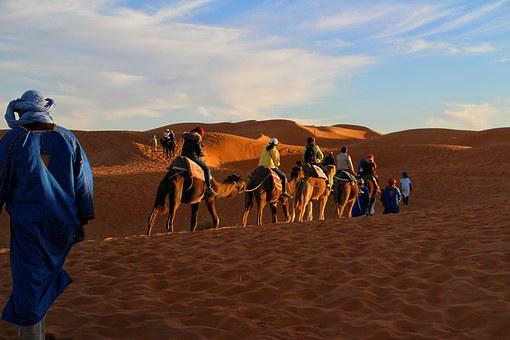 The Romans used the camels to patrol their borders with the Berber communities. Soon, some of the Camel fell into the hands of the Berbers and this was used it to enhance their movement in the desert. Another factor that contributed to the rise of the Berber kingdoms was trade. Berber merchants, not only established commercial relationships with the people of Carthage, but also established commercial activities in gold and slaves. It is believed that they established the trans-Saharan trade in gold and slaves. The Berber merchants imported goods which were distributed through a network of regional markets by local traders in the villages. Market tolls were charged in these markets and the money poured into the coffers of the kingdoms. The merchants also exported wheat, wool and ivory to the outside world which they exchanged for what they needed. The Berber kingdoms established military relationships with the superpowers of the time and this also contributed to the sustenance of the kingdoms. With the help of Carthage, some Berber local chiefs were able to hold their own against their rivals in the region. After the defeat of Carthage by the Romans in the second Punic Wars, a Berber leader went into an alliance with the Romans. He became the king of the Numidia kingdom and ruled for 50 years with the support of the Romans and his dynasty lasted for seven generations. The Berber kingdoms pursued a vigorous agricultural production and this also contributed to the rise of the kingdoms. In the plains of Cyrenaica and the Maghreb, a lot of food was produced, including wheat, fruits, wool, livestock, skins and hides. The plains and the Maghreb became the bread basket of the Berber kingdoms. So much was produced to satisfy the domestic market and the rest were exported to other parts of the world. The skills of the Berbers in metal technology also contributed a lot to the rise of the Berber kingdoms. The skills in the extraction of iron ore from rocks and the ability to turn the iron into implements helped to prop up the Berber kingdoms. On the one hand, the Berbers were able to manufacture agricultural implements to aid in food production. On the other hand they were able to manufacture implements of war with which they were able to ward off attacks on their kingdoms and also to be able to wage wars on their enemies.